Philadelphia's Trocadero Theater is the oldest operating 19th century theater in the US. 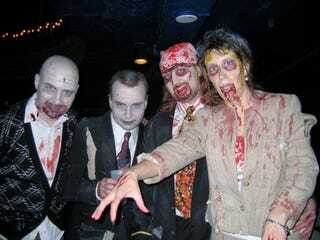 Last night, it was invaded by zombies. Monday night marked a confluence of modern geekage and Victorian architecture, as more than four hundred people showed up to see the Geekadelphia/Philly Zombie Crawl/Trocadero Monday Movie Night screening of Zombieland. People came in costume, there were prizes awarded and a raffle to be conducted, there was beer; it's hard to imagine a better way to spend a Monday night, especially if you like zombies. The Trocadero is a venue that practically begs to be itself the set of a zombie movie: from the narrow, leaky stairway up to the balcony to the huge chandelier and scary baroque face carved over the stage's proscenium, everything about it suggests a kind of decaying grandeur. The place is in excellent condition, of course, and it's a beautiful place to watch anything, but there's no denying that it's old-a relic of another era that is miraculously still around, and a perfect setting for Zombieland's tour through cannibal-maniac-ravaged America. The folks from Geekadelphia have decorated the walls with signs illustrating the thirty-two rules describe in Zombieland; for the short but harrowing walk up to the balcony, they seem less like light-hearted shout-outs to the film's fans, and more like actual warnings. Once we attain the balcony bar, it seems more like a regular party-people of all manner and stripe are here and drinking, and about every tenth person is covered in some kind of faux-blood-and-gore for the zombie costume contest at intermission. The doors open at seven, and the movie won't start for another hour; no one is complaining. I found Dan Tabor, one of the organizers from Geekadelphia, snapping pictures for the blog (that's him on the right; Matthew Bilik on the left). Dan, like many Philadelphia natives, grew up with the Troc as one of the best-known live music venues in the city. It was a natural choice of setting for a geek event in Philadelphia. "That's the great thing about Geekadelphia," Dan says of his fellow organizers, "is we can take these things that people in Philadelphia have grown up with, and sort of make them our own." His goal seems to be succeeding: the place is packed. This is the second screening that Geekadelphia has done at the Trocadero. The first one-for the Diablo Cody-penned Jennifer's Body-didn't go as well. Tabor attributes the difference to how soon and how effectively they got the word out; this time around, with the help of Philadelphia's Zombie Crawl initiative, word of the screening had spread like wildfire, a testament to the social media that has made something like this possible. The movie starts, and the crowd is raucous and drunk, begging the question as to why more movie theaters don't serve three-dollar Pabst or (my preference) Yards' Pale Ale. No one enjoys a movie of any kind more than drunken geeks, and this crowd is no exception. I don't have much to say about the movie itself-there are plenty of reviews around-but if you haven't seen it, let's just say this: Romero has mined basically all there is to mine that's serious about the zombie premise, leaving Zombieland to take everything absurd and hilarious about the idea, distill it into a potent liqueur, and then smash it into your face with a banjo. It is a move that screams to be watched with friends, the more and more drunken the better. The most startling aspect of the movie, however, is the irony of its main character (Columbus) as a stereotypical nerd-an neurotic misfit who is painfully antisocial. There's something strange about seeing Columbus on screen and recognizing him as a kindred spirit, despite the fact that I'm surrounded by four hundred other people who all think the same thing. Well, presumably-maybe that's still an old-fashioned idea? Something else that's a little surprising is how young the audience here is, compared to the last geek-gathering I went to (the PhilCon), where it was apparent that the mean age of attendees has been creeping slowly upwards. The movie breaks after the hilarious celebrity cameo (a cameo that must go down in history as the best inclusion of a celebrity as himself in any movie, ever) so that we can do the costume contest. Geekadelphia has weighed themselves down with schwag; prizes are awarded left and right according to a set of criteria that is as opaque as it is irrelevant. There are copies of Pride and Prejudice and Zombies: Dawn of the Dreadfuls (not available to the non-zombie attired public until March) and Wolfman t-shirts to give away. They've got stacks of comic books, Daybreakers merchandise, and, inexplicably, a guitar. The costumes range from some pretty impressive makeup effects like Danielle Elliot's—who's been perfecting her techniques at regularly-attended Philadelphia zombie crawls—to the inexplicable. Riddle: how do you make a Dharma zombie? Answer: you need to land a radioactive meteorite on top of some electromagnetism. IT IS YOUR DESTINY. (Local beer expert Rachel Piot, blowing everyone's mind by drinking generic). The audience is even noisier for the second half of the movie, because we've had the chance to stock back up on cheap beer during the intermission. Still, no one cares. By the end, Columbus has found his family, and it's plain that the old idea that geeks are socially-maladjusted outcasts needs to be put to rest for good. Maybe it was true when we were kids. Dan Tabor agrees on that score. Growing up, "you were lucky if you knew three guys around your house who were into this stuff. Social media has changed that, though. It doesn't have the boundaries that it used to." Instead, we can go with four hundred of our closest friends to a movie screening at an old Victorian theater where it is literally impossible to look out place—brought together by our love of watching zombies getting their faces smashed in. Philadelphia Zombie Crawl hopes to one day break the world record of zombie crawl attendance. The Trocadero does movies on Monday nights. Tickets are three dollars which goes towards the purchase of your first drink, are you kidding me? Chris Braak is an editor of lit & cult/ure blog Threat Quality Press, and emperor of the moon in exile. His credentials, accomplishments, and accolades are too numerous to list.